Industrial grade Guar Gum powder are use in oil well fracturing, oil well stimulation, mud drilling and industrial applications such as a stabilizer, thickener and suspending agent. In the oil field industry, guar gum is used as a surfactant, synthetic polymer and deformer ideally suited for all rheological requirements of water-based and brine-based drilling fluids. 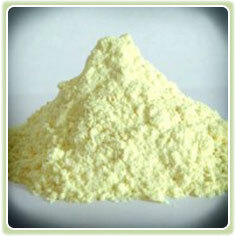 Due to its high viscosity, Guar Gum products are used as drilling aids in oil and gas well drilling. When mixed with water, its naturalviscid properties aid in maintaining drilling mud viscosities and to enable to remove drill waste from deep holes. Guar gum products also reduce friction in the holes, and so minimizing power requirements. Some Guar Gum products act to minimize water loss should occur in broken geological formations. By Brooke field Viscometer at 25 Deg C, 20 rpm; Spindle No-4; Solution - 1% 2500 Cps Min. 4000 - 5000 Cps Max. 2500 Cps Min. 8000 - 9000 Cps Max. 2500 Cps Min. Moisture 7% - 12 % Max. 7% - 12 % Max. 7% - 12 % Max. Sieve Passing 98 - 99 % Min. 90 - 99 % Min. 98 - 99 % Min. Proteins (N x 6.25 ) 5.0 % Max. 5.0 % Max. 5.0 % Max. Fat Content 0.4 % Max. 0.4 % Max. 0.4 % Max. Acid Insoluble Residue(A.I.R.) 3.0 % Max. 3.0 % Max. 3.0 % Max. Ash 1.0 % Max. 1.0 % Max. 1.0 % Max. Gum Content ( by difference ) 80 % Min. 80 % Min. 80 % Min. Packing can be tailored to meet customer requirements. Copyright © 2012 Amerisuncorp.com. All Rights Reserved.